It was a happy morning when I left the house today. I opened the door and said, “Ok girls left go,” and two golden retrievers raced each other out the door and to the truck. 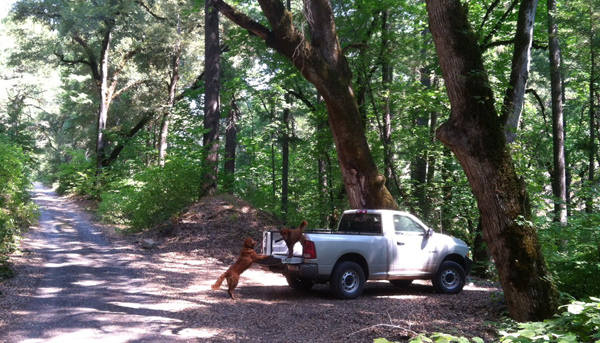 I usually take two dogs with me when I go to the woods and they ride in the back of the truck. 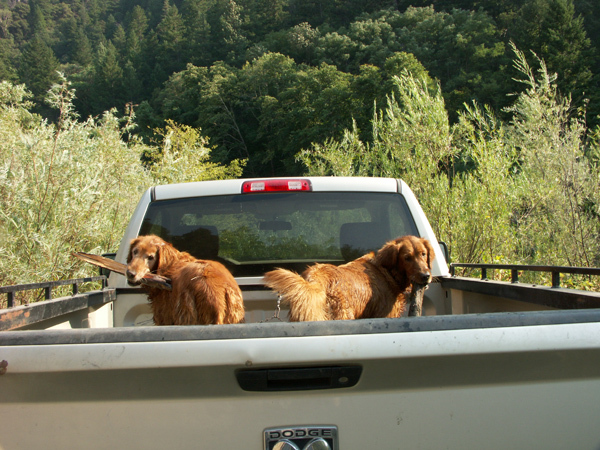 According to my dogs, all of that empty truck bed is being wasted with out a dog. Today we traveled to the coast. It was a hot day inland but cool on the coast. It was good day to take my furry buddies along. I loaded up the mother-daughter duo of Nellie and Blitz. Once secured we headed west. Taking the dogs to work has its own special requirements. The summers here are hot, very hot, 115 degrees hot, so the dogs can’t go every day. Today it was in the low 90s inland, but only in the 60s on the coast. It was a good day to ride along. This is the time of year when the road department is doing all kinds of road construction. When traffic is stopped by the flaggers, I try to stop my truck so the dogs are in the shade. I can’t always do it, but I do it when I can. The dogs have taught me that they need a break every couple of hours to air out. 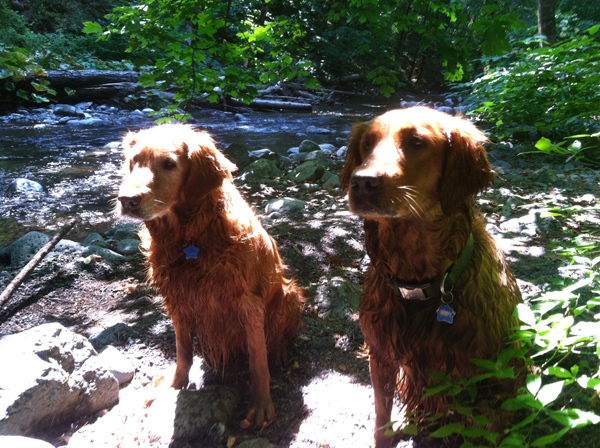 When it’s hot they need a swim too, and the stops are more frequent. A soaking wet dog is the best air conditioning on those hot days. When we stop for a break, I like to pick out a remote spot away from the highway where they can safely get out and run loose. 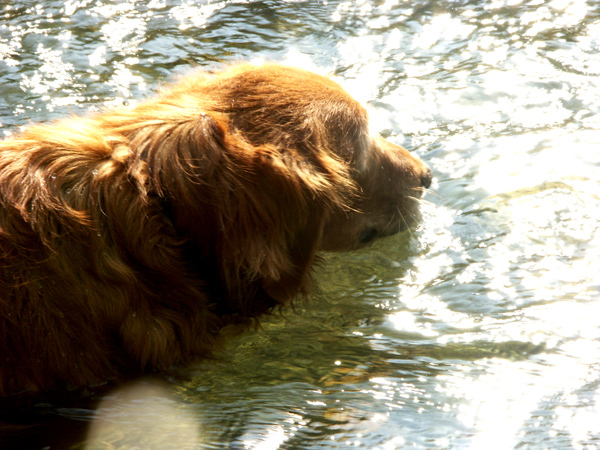 I like to pick a spot with water, preferably swimming water, because as every golden knows a drink of water taste best while you swimming in it. 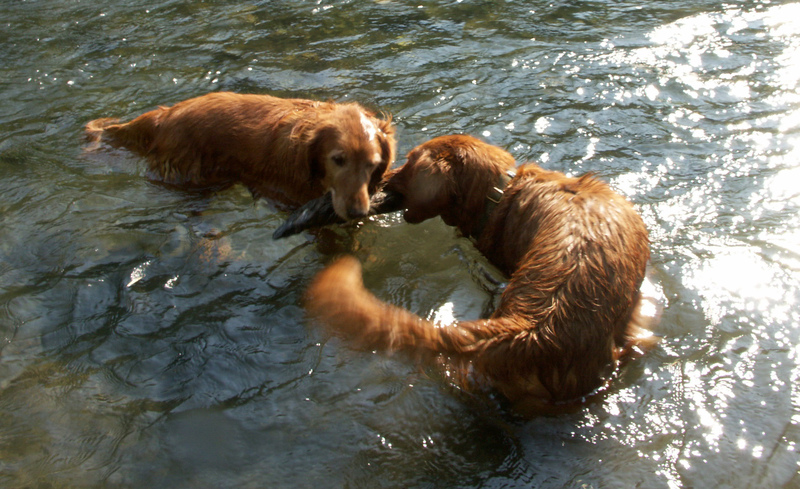 After a drink, we have to fetch a hundred or so sticks and then eat grass along the riverbank. Then it’s time to load up and hit the road. Down the road we go with a couple of brand new sticks to go with the other forty already in the back of the truck. I travel through many of the same areas frequently enough to learn all the good places to stop. I will use those places over and over again. That way I know what to watch for. When picking a spot to stop I also look for what to avoid. 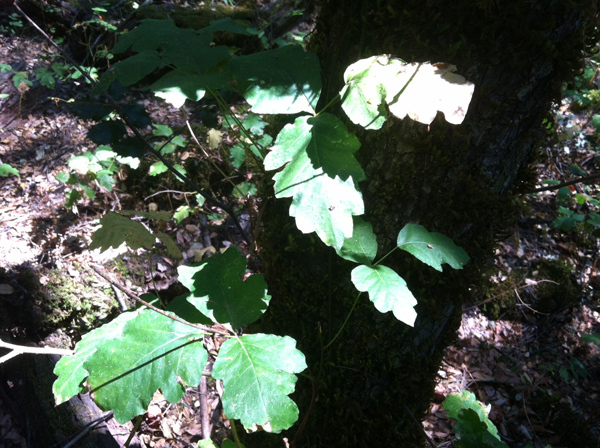 Around here, poison oak is near the top of the list. The dogs don’t care about it, but they aren’t the ones that get it. It’s miserable when they give it to me and even more miserable when we bring home for my wife. Not good, because then we are all in the doghouse. Other things to avoid are rattlesnake areas and foxtails. For those of you unfamiliar with foxtails they are a nasty sticker that will bore into the dog’s noses, ears and between their toes requiring a trip to the veterinarian. Often an inspection of the site is in order before the dogs unload. Taking them along definitely takes a little more time and care, but nonetheless it is a joy to have them ride along. When we get home, I have two very tired and satisfied golden retrievers. They crash out on the rug after a long day on the road. Over the years, I’ve had my share of canine emergencies that I had to deal with. So, just remember when taking your dogs to work that sometime things happen and you have to be ready. When the dogs are so well traveled and so active they have more opportunities to get into trouble so be careful out there, but have fun.